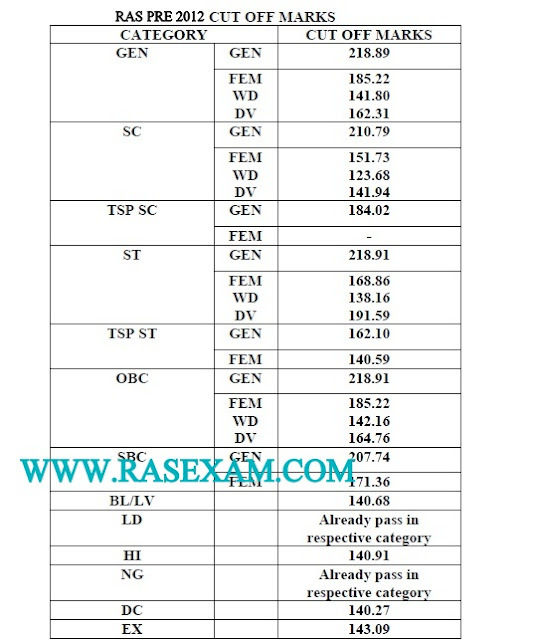 RAS PRE 2012 Cutoff Marks for GK, Subjects: Rajasthan Public Service Commission (RPSC), Ajmer has announced RAS Pre 2012 Results on 23rd November 2012 on RPSC Ajmer official website www.rpsc.rajasthan.gov.in and RAS PRE 2012 Cutoff Marks for GK, Subjects are released on RPSC Results website. THE RAJASTHAN STATE & SUBORDINATE SERVICES COMBINED COMPETITIVE (PRELIMINARY) EXAMINATION, 2012 HELD ON 14-06-2012 ARE DECLARED PROVISIONALITY QUALIFIED FOR ADMISSION TO THE MAIN EXAMINATION IF ANY CANDIDATE IS FOUND THAT HE/SHE DOES NOT FULFILL THE CONDITIONS OF ELIGIBILITY PRESCRIBED AS PER ADVERTISEMENT/RULES, THE COMMISSION SHALL REJECT HIS/HER CANDIDATURE AT ANY STAGE. Yes Dear, This is thing to notice, How to general Category's Cut off marks may less than the ST's Cut off Marks ( ST Cut Off Marks - 218.91 while General's Cut Off marks - 218.89). This is not justification. Ras pre exam 2012 me jin optional subject me -VE scaling haui hai ,un candidates ke gk ke bhi marks kate gaye hai,GK ke marks kyon kate gaye hai jabki gk ka paper sabke liye saman tha.